Recently we have achieved almost the impossible and potentially placed a conveyancing solicitor in London. The post is for someone to build up a department within an expanding firm and the candidate has been very grateful for the opportunity, having been made redundant by his last firm who he was with for some years. I received an email from the candidate a few days ago which gave me food for thought and perhaps other candidates too as this candidate was clearly intent on adding extra value to his position. He emailed to say that before he joined he would be going into the firm to meet all the staff and get acquainted with their IT systems. He would also look at establishing his systems for dealing with the conveyancing and spend some time assessing how to achieve this. Not only this, but he would also go to brokers and estate agents in the local area and introduce himself and tell them that he was opening a new department at the firm. He would also start to put together his strategy for marketing and see what work he was going to do to attract business in. I thought this was very interesting as I have advocated this to candidates in the past who have politely listened to me but one gets the feeling that they either view you as completely insane or rightly over the top. However, this type of approach adds real value to your worth to a firm. Once you have accepted a post, it does not stop there and you automatically join the firm and work. If you make an effort to either speak to the firm beforehand or go and see members of staff to see how you would fit in, and also whether there is anything you can do before you start, you automatically create the impression that you are enthusiastic and would be an asset to the firm. If you start on this footing it often is the case that you will carry on in a similar vein. With this in mind and worth to your self and put in the partners’ mind that you are a candidate worth holding onto and nurturing as opposed to simply being there to earn fees and stay in the same role for a long time. Jonathan Fagan is Managing Director of Ten Percent Legal Recruitment (www.ten-percent.co.uk). You can reach Jonathan for comment at cv@ten-percent.co.uk or visit our website for details of our services including all aspects of recruitment and career coaching. Until very recently it has been a rare occurrence to get a conveyancing candidate any posts in the north east of England. When we do get them, we usually get lots of requests from firms and register a whole raft of new vacancies. In the last week, I estimate that we have had over six good quality conveyancing and commercial property candidates register in the north east as well as wills and probates and other fields on top of this. It appears that the wave of redundancies that have been going round the UK have finally reached the north east and some of the larger and bucket shop type organisations have started to lay off staff. The quality of the candidates being laid off is very interesting. A couple appear to have spent a good number of years with the firms they have been laid off from. Their billing levels are quite frankly phenomenal. Salary levels on the other hand are pretty appalling bearing in mind the billing levels and what is even more surprising is that the firms are letting them go when they have their own referral systems in place. Other candidates have not been quite so good in that although they have had the threat of redundancy placed on them, they have not quite grasped the current situation in the conveyancing job market and have a string of conditions attached but very little to offer a firm. The usual issue is the question of salary and most of this type of candidate start off with a specific salary range in mind that have not realised that this is unlikely to be more than they’re currently paid and is likely to be less than they are currently paid. I anticipate that the north east will not struggle particularly with soaking up the redundant staff from the larger players because it has traditionally been understaffed in conveyancing in any event and there are still firms out there looking who have been looking for a very long time. I hope to be able to assist a good number of these candidates in a way that we are not able to do in London. A question was recently asked in a Magic Circle firm of someone who had been to a new university (former polytechnic) as to whether they were ashamed of their degree (and by inference the university). The question was a very interesting one, not only for the position it put the interviewee in and the challenge that the question faced from that angle, but also because of the perception of new universities in the legal profession. Sometimes people forget that many years ago the only students who were allowed to study law were those who gained very good A-level grades of As and Bs and went to a red brick university. Polytechnics on the whole were offering courses, but they were not geared towards people qualifying as solicitors but rather being academics or a mix of work and were not usually LLB degrees. I could be wrong on this and I apologise profusely to the former polytechnics if this was not the case, but there does seem to have been a complete change in the courses of recent times. Nowadays every university college and former polytechnic offer law degrees, and they usually offer them to anyone who is alive still as opposed to anyone with very good A-level grades. Partners of law firms come from a generation when you had to have good grades to qualify as a solicitor or barrister. This means that when they look at a CV and notice A-level grades like D, E, E or GCSE or O-level results of a similar level, they are very likely to be quite biased against you. The graduate who was asked the question about being ashamed of her university said she understood entirely that they were looking for consistency in the academic qualifications of a candidate. Obviously if you have only managed to get D, D, E at A-level, it is unlikely you will be attending a red brick university to study your law degree and as a result by the very definition it is likely that a lot of the students at the former polytechnics and new universities do not have very good A-level grades. Most students who get good A-level grades are rarely to be found in such institutions as they do tend to focus on the red brick universities because not only are the courses considered better quality, the universities are held in greater esteem and offer more scope for progression at the end. Furthermore, the requirements to get into the older universities are usually more onerous which indicates a good level of teaching to anyone wanting to apply. My own perception of new universities is probably along those lines. I still look at CVs now and if I see that someone has been to a new university I almost do not need to look at their A-level grades to see that their academic history is not consistent. It actually makes life very easy if reviewing a whole batch of CVs to be able to spot those who are going to be looking at very good quality firms and well paid jobs and those who are going to be looking towards the more high street end of the market. It is perhaps this bias that leaked out during the interview question I have described as I am sure it is a view held similarly across the legal profession. The Magic Circle firms, there are a lot of Oxford and Cambridge graduates and just particular sort of university graduate does not appreciate students who have failed in their academic history so far, but might be doing Oxford and Cambridge graduates a disservice, but I think this is a fairly accurate view as Oxford and Cambridge students and graduates consider themselves to be quietly superior to just about every other student from a different university and this is probably quite a fair perception to hold as it is certainly an achievement to get into those two universities regardless of your background status in society. Interview question – are you ashamed of your 'new university' degree? Believe it or not this question was asked in a recent Magic Circle firm in London of a student with a first class degree from a new university as opposed to a red brick university. It was in the context of a question about the status of the university and the achievement of gaining a first class degree. The interviewee admitted being very surprised at the question and felt that she may have come across as defensive when she heard it. One of the things that came out of lecturing to students on an LPC course about CVs and interviews was to be prepared for questions like this, as they are regularly thrown into interviews. In fact, I am glad that I have heard about this because I often get queries from students and clients who have used our career coaching service as to why some of the questioning I undertake is quite hostile. There is really no way to prepare yourself for a question like this without being asked critical questions by someone else and practice answering in an non-defensive or aggressive way. If you are asked a question like this, it is important to ensure that you retain the same cheerful composure that you had before the question, regardless of whether you want to attack the interviewer and inflict terrible injuries, and to ensure that your answer is as non-defensive as possible. A good answer would be no, I am not ashamed of my degree as a first class degree on any course I feel is an achievement, and I am not sure that it makes any difference where the degree is from as to the status of it. Another thing to do if you have a first class degree is to ensure that you know the statistics from your university as to the number of students who receive a first class degree in any given year, or the number of students who have received a first class degree in the last five years on your particular course. I am pretty sure that most universities would be very happy to give you this information. If you have this it makes your answering a lot easier and a lot easier to cope with the question about a first class degree. I am not sure that this will be an issue for 95 percent of students, as the vast majority of us do not have first class degrees. However, if you are asked a similar question in interview, you have to think about why you’re being asked the question. The reason is that the interviewer probably wants to see how you handle it, and is not necessarily as interested in your answer as in the way you deal with it. If you adopt the somewhat aggressive nature that a lot of LLB and LPC graduates take when going to interviews because they believe this is what a lawyer should behave like, it is very easy to get tripped up with questions like this, as you will all to easily be quite angry and feel insulted by the questioning. The interviewer is seeing exactly how you handle it and whether you can maintain a good composure and appear nonplussed by the question. If you have a think about when you are in practice and you have an awkward client who asks you a question that you don’t like, then it is important to be able to answer in a dispassionate way without getting upset. This sort of questioning is very good at determining who is going to be able to handle these questions and who is going to struggle and get angry. Jonathan Fagan is a recruitment consultant with Ten Percent Legal Recruitment (http://www.ten-percent.co.uk/). He takes an active interest in the recruitment process and regularly conducts career coaching for law students and graduates, details of which can be found on the website in the Career Centre. Career Coaching for Lawyers, Law Students and Graduates. 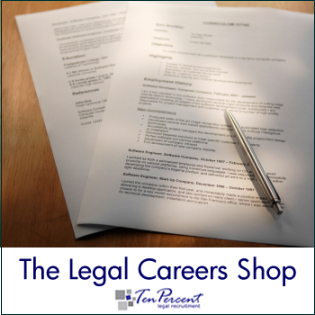 Ten Percent Legal Recruitment has been coaching solicitors, barristers, legal executives, overseas lawyers, law students and graduates with career changes, interview practice, careers advice, career plans and strategies since 2000. Over that time, we have seen a number of the people we have assisted find training contracts and qualify as solicitors and also obtain pupillage and become barristers. The service is suitable for anyone who is either contemplating a legal career, currently working in the legal profession at all levels or studying to become a lawyer in the future. The vast majority of people have a specific issue that they want addressing and subsequently have a whole raft of matters to consider that follow on from that. A quick example would be the graduate who had attended five or six training contract interviews but had not got any offers. The issue was for the consultant to determine why those interviews were not resulting in offers. It became quite apparent after about 20 seconds of the interview why the client was struggling so much. He was actually staring at the floor or over the shoulder of the interviewer when he was being asked questions and came across as completely out of his depth during the interview. This meant that he was being rejected despite having very good academics and work experience, and on paper looking as if he would make a very good lawyer. Another example would be a senior solicitor who had become stuck in a rut - he wanted to ensure that he did not spend the whole of his career doing something he no longer enjoyed. We explored a whole range of issues, culminating in determining that it may well have been the current firm and situation he did not enjoy rather than the field of law, and we subseqently provided ongoing support to him in relation to this. It is often very easy to get advice from friends and colleagues, but unfortunately most advice given on a careers basis is not impartial which means that there is almost always some element of opinion that goes into the advice. Our career coach is a qualified solicitor and also a qualified recruitment consultant. He regularly undertakes business consultancy work as well as recruitment consulting for law firms up and down the UK. He also prepares CVs for students, graduates, qualified solicitors and partners as well as barristers, BVC students and legal executives. We have a unique position in the industry as not only are we recruitment consultants but also business and management consultants and careers advisers. This means that anyone coming to see us gets the benefit of all three strands of our business thrown into one. We hold our career coaching sessions in London, Milton Keynes, Bristol, Carlisle and Chester and they are always on a one to one basis. Dates are usually available throughout the year with a few weeks notice, although we can offer emergency sessions as required. If you would like to use the service, please visit our website and follow the links to the Careers Centre where you can obtain full information about the service on offer and book online as well. We look forward to seeing you and discussing your needs. Interview question – How many training contracts have you applied for? This question is often asked of potential trainee solicitors to see how successful they have been in finding a training contract. It is a very difficult question to answer truthfully, because you can come across so badly with which ever answer you give. Looking at it from the interviewer’s perspective, I think at time the question is asked more to see how you deal with the question rather than what you actual answer is. For example, if you were to say I have applied for over 100 training contracts, this would mean from the interviewer’s perspective you have a scattergun approach and don’t really care which firm you get the training contract with, nor what field of law or what quality of practice you are aiming at. If you were to say, I have applied for five firms that I have carefully chosen from a very long list and you were one of them, the firm will probably not believe you and also think you are a bit lazy perhaps for not considering more applications to more firms. So what is the best way to answer it? To be honest, I am not completely sure but I think the best option would be to have similar firms in the area in your mind and to say that you have applied to John Smith & Co, Fred Jones and John Davies & Co as well as a couple of others and you have carefully selected these because of geographical location, types of law and also their reputation in the legal profession. You would then be making sure that the firm could not consider your approach to be scattergun, and also that you were not being lazy with your applications in that you have been carefully considering your options rather than just not bothering applying to very many firms. It is not technically telling an untruth if you just give a selection of the firms that you have applied to. Obviously it would be if you said you had only applied to those firms but if you were deliberately vague with your answer I cannot see there being a difficulty in terms of needing to be completely honest when applying for jobs and being at job interviews. ILEX route into the legal profession - via the back door? I recently wrote an article for graduates with 3rd class degrees. ILEX organisation contacted me to ask why I had not mentioned the legal executive route into the legal profession for graduates with 3rd class degrees. As a result I thought it might help if I wrote an article on the route explaining perhaps somewhat anecdotally the perception of legal executives within the profession. I must say that my opinion remains the same for students with 3rd class degrees – i.e. that although it is not impossible to find a training contract and go down the legal practice course route, most students with a 3rd class degree should think twice before paying for the legal practice course as vacancies are far and few between where someone with that level of degree would be considered for a job, simply because of the competition, lack of training contract places. However, ILEX are quite right in that the legal executive route is an alternative option for anyone who decides they do not wish to do the legal practice course and spend such vast amounts of money to start off with. The path is quite clear. You basically complete your law degree if you have already started and then enrol with the college at a particular level. I understand that you gain exemptions for having a law degree, but you would need to check with ILEX to see what exemptions you are currently entitled to. It usually takes about five years to become a fully qualified legal executive with Fellow status. A Fellow of the Institute of Legal Executives (FILEX) is considered as good as a solicitor in terms of qualifications. Traditionally the problem for such qualified legal executives is that the advocacy rights were restricted, which meant that they could not do the same work as a solicitor and would have to either instruct externally advocates to appear in court or get a solicitor to do it for them. However, with the recent introduction of rights of audience for some legal executives with a particular qualification, things have changed and it is now possible for FILEX and ILEX in some circumstances to gain full rights of audience before various courts and tribunals. So how are legal executives perceived within the profession? The first point is usually backed up by salary levels. Traditionally even though legal executives can bill the same or more than solicitors, they have not been rewarded to the same degree financially. To illustrate this, a legal executive with two years experience in a high street field such as conveyancing will invariably be on at least £5000 less than a solicitor with two years experience conveyancing. There is some justification for this, a solicitor with two years experience has been in training for over six or seven years, including a degree and post graduate qualification. A legal executive has completed examinations that some would argue are much more basic than the demands of a law degree and the LPC, and they do not have the same considered level of professional status that solicitors have. This is the first consideration for anyone who decides to take the ILEX rather than the solicitor route. Your salary will be stunted and also in a lot of firms restricted to a certain scale, and you may also find that your salary will never go above a particular level because of the salary a solicitor has in the same firm and the concern of the company to try and avoid a discrepancy in their pay scales. Secondly, there is an element of dismissal in the legal profession about legal executives and the level of work that they are capable of doing. Despite the ILEX colleges best efforts, it has to be said that anyone qualifying, or the vast majority of people qualifying through the legal executive route are not academically gifted students who have performed consistently throughout their career to date. I have not seen many CVs for legal executives where they have very good A level results followed by a good degree. Most legal executives I have seen CVs from have come the back door route into the profession, i.e. they don’t have the academic qualifications behind them, and have come down a professional route to get into law. The perception in the profession as a result is probably quite accurate to a certain extent in that the vast majority of legal executives with more than a few years experience are either former secretaries who have decided to train up and become lawyers, or people who have tried to enter the legal profession but who lack the formal qualifications required. From this perspective, the route of legal executive remains a back door into the profession, and although this may sound dismissive of legal executives and the work that they do, I’m afraid it is the reality of the habituation in the profession. There are a lot of legal executives out there who are well paid, highly skilled, and who have been with firms for many years generating good billing rates. There are also a lot of legal executives out there who are almost cannon fodder to a certain extent – used for quite menial tasks in firms, verily wish to do, they find that their work is not particularly good quality or interesting for them. Another problem legal executives have with the perception of their strand of the profession is that the pay very much tends to be like secretaries in that if a firm like you and keep you for a long time you get paid well, as a cue for one firm to another, you find the next firm do not necessarily wish to pay you at the same level you have been receiving, and suddenly you have to take a massive pay drop. Until recently, another problem has been that in order to get on and progress to partnership or often senior management level, you have needed to do the legal practice course at a future date and qualify as a solicitor. Things have changed a little bit, as it will soon be possible for legal executives to be partners in firms and this may remove the need of legal executive to have to bother spending many thousands completing the legal practice course, which is very often a complete waste of time for them as they have been in practice for longer than the people who are teaching them the course. It will be interesting to see how the reputation and standing of legal executives changes with the new Act coming in to allow them partnership status and also with the new advocacy rights. Perhaps law firms will start valuing legal executives more, particularly because I suspect that their pay will not necessarily increase very dramatically. I hope I have not done legal executives a disservice in this article, my own opinion is that there is still a perception the profession that they are very much second rate citizens, and anyone wanting to become a solicitor with a consistent academic background and reasonable work experience should not consider going down this route but focus solely on completing the legal practice course and obtaining a training contract. Jonathan Fagan is Managing Director of Ten Percent Legal Recruitment. He is a solicitor (non-practising) so perhaps slightly biased against legal executives! You can contact him on cv@ten-percent.co.uk for free careers advice. Interview question – where do you see yourself in 5 years time? This made all the consultants laugh, but brings me to a point that we often discuss as consultants is, how much humour should you use in a job application, when is it appropriate and when should you avoid it. If somebody said this to me in an interview, I would probably be relatively amused, it is a funny thing, quite a witty thing to have said, but also felt slightly uncomfortable at the use of this. I have to say that my advice to people over the years when it comes to interviews, CVs, covering letters and application forms, that humour should be avoided at all costs. You are able to impart your humour when you attend for interviews, this is a vital part of the interview process – i.e. making sure that you share a similar sense of humour with the person you are interviewing. However, putting comments like this on a written application or CV, is probably a bit OTT. I’m not sure I would mention such things in an interview either, also slightly risqué for the purposes of a solicitor. Jonathan Fagan is Managing Director of Ten Percent Legal Recruitment (www.ten-percent.co.uk). He regularly comments and advises on the state of the legal recruitment market. He can be contacted at cv@ten-percent.co.uk for press comment or free careers advice. Should I take the ILEX route or the training contract route in order to qualify as a solicitor? This question was asked yesterday on our careers line. The student wanted to know whether do the LPC (Legal Practice Course) route or go down the ILEX (Institute of Legal Executives) route. There are disadvantages and advantages to both of these routes into the legal profession. The main advantage of doing the legal practice course is that if you are lucky enough to get a training contract, you will find that you can train as a solicitor within three years. This means that you only work for peanuts for two years as a trainee solicitor before qualifying and receiving what could be argued as a reasonable salary. The ILEX route means that you have to work in the region of about five years for a somewhat meagre salary and then do the legal practice course in order to qualify and even then, you may need further experience before the Law Society will allow you to be admitted. Therefore, if you wish to qualify quickly then the LPC and training contract route is for you. The main disadvantage of the legal practice course is the cost. Universities and colleges have long seen the advantages of this course in terms of generating income for their institutions, and with the price being between £6000 and £10,000 to study for this course, you will be paying off a loan for quite a number of years after completing the course. This means that you start your training contract in rather a lot of debt, and with the salary on the high street being no more than £16,000 on the whole, as a trainee solicitor, you are unlikely to be paying it off for quite a while. If you go down the ILEX route of course, you can work whilst you’re studying and the ILEX courses are not as expensive at the legal practice course. Often, as well, firms are quite happy to pay some of the cost of this course as it is more work related than the legal practice course (or is perceived to be) as the legal practice course is often considered in private practice to be somewhat out of touch with realities. Also, firms find that most trainee solicitors start effectively from scratch when they begin the training contract work, and are incapable of most of the activities of a lawyer. Pretty much all trainee solicitors need their hands held for the first six months, whilst they find their feet in the world of work, whereas legal executives on the whole tend to be people who have been working for some time and understand the concept of work, which of course, a lot of students and graduates find hard to fit into. The other problem with doing the ILEX course is that it is not recognised as a conventional way into the profession as a solicitor. Questions will be asked for the remainder of your career as to why you went down this route rather than the training contract route and of course, you are unable to give the real answer – i.e. that the cost was prohibitive and you were unable to find a training contract. So my advice would be to seriously consider the legal practice course from the outset if you are committed to a career as solicitor. If you are concerned that you do not know enough about the job a solicitor does, then go and get some experience, and if you are unsure as to whether you will find a training contract either because you lack the commitment or wish to avoid too much exposure to the costs from the outset, you may wish to consider the ILEX route so you spread the cost over a period of time. There are advantages and disadvantages of both. You are a job agency, aren’t you? I’m sure I’m going on with this conversation, it is very boring. However, suffice to say, this conversation carried on for a further minute before it transpired that this was a particularly cantankerous LPC graduate who presumably had been watching too much LA Law or This Life and the way to get into the legal industry was to march your way in and be rude to everyone you speak to. There is almost an assumption amongst people from other industries coming into the profession that there are jobs aplenty, the idea of the purpose of legal job agencies is to simply find anyone who wants one a job. You’ll see in our blog and on our website (www.ten-percent.co.uk) numerous articles and comments to the effect that our legal recruitment agency is simply unable to assist with any training contracts applications for inexperienced or temporary legal roles as we specialise in permanent and temporary work for qualified or experienced staff. It does not seem to matter for some of these people who seem to think that this is simply put there to deter the weak minded and if they phone up and pretend to be strong and sturdy individuals and speak to you as if you are mud on the end of their shoe that you might be persuaded to help them and give them a job. I regret to say that that is not the case, and usually these telephone calls end pretty abruptly with me or one of my colleagues informing the person that they really should look at our website and read all the notes on there before bothering us on the telephone. It is about the time of year when lots of law students finish their courses and wonder what on earth they’re going to do with themselves for three months until the next year of their degree starts. This time of year terrifies me, because on the recruitment side we can be very busy picking up new vacancies and dealing with new newly qualified solicitors, and yet at the same time we have to handle telephone queries from law students wanting jobs. It can be infuriating when a call comes through to arrange an interview but the consultant misses it because he’s busy on the phone trying to explain to yet another LPC or LLB student that they really need to look on the website for details of our services and that we are unable to assist. If you are reading this and are a law student or graduate, read our website, don’t ring us unless you wish to purchase one of our paid services. Our consultants will be polite but firm, and will try and get rid of you as quickly as they can. This is not discrimination by any stretch of the imagination, it is simply business. You are not worth anything to our company at this stage of your career, but we have to concentrate on generating income so that we can continue to provide free advice on the site for law students and graduates to assist them in their search for training contracts and work experience. Help us to help you (there’s a good strap line). Jonathan Fagan is Managing Director of Ten Percent Legal Recruitment and really loves law students and graduates, whatever the time of year. However if you wish to ring him about a training contract or work experience placement, please don’t. If you wish to email us for careers advice on any subject please do on cv@ten-percent.co.uk. There was a report online on 16/05/08 that the number of jobs increased in the first quarter of 2008, it shows no signs of reducing in the second quarter. The survey was done by a marketing agency, who also compared this against the amount of business being undertaken in the marketing industry, discovered that the spend on marketing was also up in the same time, particularly with advertising for jobs and recruitment agencies. The prediction of the report was that marketing online would increase by 25% over the next four years, marketing in hard copy and newspapers would decrease in the same time by about ten to 15 percent. So what does this show us about the economy? Well, at the same time, there was an article in The Observer to say that parts of London had seen house price increases this year of up to 20%, and in other areas of up to ten to 15%. I have also read that whilst decreases in values have occurred in flats and undesirable houses and locations, the remainder of the market stays just as buoyant as ever, with sales and purchases going unaffected by the so-called credit crunch. I have to say that I can appreciate that part of the recession probably really is a recession, but in the back of my mind, I question who stands to benefit from ramping up the so-called credit crunch and making it something that it isn’t? Firstly, anyone who wants to invest in shares stands to gain from reporting a credit crunch, as one of the first things that gets affected is the share price of companies. Secondly, with fuel prices increasing, not only do the government gain but also the oil companies, who report record profits year after year after year with no sign of abatement. Thirdly, the food companies with reports of food prices going up, the suppliers such as Northern Foods and other similar companies obviously gain because they are able to increase their profit margin on the size that they make to the supermarkets and the supermarkets then add to their profit margins by simply blaming the cost of living and inflation on increasing their prices. It basically becomes a free for all, with everyone who wants to benefit, benefiting from the credit crunch and those who are the consumers of all these services and products are the ones who stand to lose. I have to say this spills into the legal recruitment world, because I have seen a lot of redundancies coming through in recent weeks but most of them are with companies who have aggressively expanded in recent times, or are bucket shop volume conveyancers or are jettisoning aged and senior staff, or staff who when you look at their CV, you don’t necessarily think immediately that you will place them. I have yet to see a good high quality CV with no blemishes from someone who has been made redundant in this recent round of redundancies. So where does this leave us? Well, who knows where the so-called credit crunch will end up, but one expects eventually that the newspapers will run out of things to say about it and move onto more interesting subjects. Maybe that world events take over and other more interesting news stories come in that do not require constant referral to the word credit crunch. I am aware of such economies such as Japan suffering massive recessions for long periods of time, and whilst that may happen yet in the UK, I suspect that on this occasion, nothing much is going to happen. Interview question – what do you see as the main challenges facing us with climate change? It has become increasingly fashionable in interviews to ask a question based on current political and economic issues and to see how well an interviewee handles them. Something like climate change is a massive area and usually the interviewee will be thinking in their mind, “Oh my goodness, what an earth am I going to say”. This is where preparation for interviews comes in very handy. On climate change, you may hold very strong opinions which could include dismissing the theory of climate change as exactly that, something with no evidence. It could also be that you are a passionate environmentalist and regularly activating with Greenpeace at weekends, blocking oil pipes, etcetera. It may also be that you hold no opinion at all on the matter, and simply do not ever think about it very much. Regardless of which camp you fall into, you must come up with a structured answer. Perhaps the best way to consider it would be to think about the positives and negatives and try and relate it as much as possible to the legal profession (if, of course, you are reading this as a lawyer). If you do not think about your answer before you give it, it may come across as slightly waffly and incoherent, which is often a difficulty an interviewer has when trying to listen to an answer with such potential breadth. So for example, with climate change, think about the question you were asked, which was what will be the impact of climate change, so start of by saying what you believe the impact will be, and what you have read on the subject that justifies your opinion on it, and then consider the second part of the question to follow it up. If you have anything else to say on a personal opinion, put this in at the end. The reason you are being asked your question, is to see how well you can marshal your thoughts and present something as complex as climate change to someone in a very short space of time. Do not be surprised if the interviewer holds his hand up half way through your answer and says thank you, as it may be that he has heard enough of your answer to decide how well you have dealt with this. Do not expect the person interviewing you to actually be listening to your response, as they may simply be assessing how well you are answering the question and your thoughts on it. Try not to give too much passion in any answer on such subjects as this as if you do you may get picked up on it and the interviewer may remember you at the end, “oh, that was the bloke who blocks up oil pipes at the weekend with Green Peace”. Another thing is that even if you hold strong environmental views, you do not know which of the oil companies and like, the firm who are interviewing you act for on a regular basis. It would be fatal to be discussing Greenpeace for any length of time. I do recall going for an interview at Eversheds many years ago, I made a comment in passing, something about Greenpeace, ears pricking up and pulling me back on it and asking me further questions about my involvement with them. It obviously would not be an issue for most firms as everyone is entitled to opinions, but I suspect that if you were regularly out campaigning that quite a lot of firms would be slightly concerned about your actions and how they would impact on the firm if you were ever involved in any direct action and got arrested. In summary, like any other question on a similar topic, you must marshal your thoughts, present a coherent answer, try not to waffle and be able to wrap things up when you get to the end of your answer with some sort of brief summary to outline what you’ve just said. Do not expect anyone to be listening to what you are saying, as if they have asked the question of ten interviewees before you, they will not be very interested in your answer. One possibility for law firms is to outsource any transcription work that is not required instantaneously. Ten Percent Legal Recruitment uses www.uk-transcription.co.uk, a transcribing company, they specialise in analogue and digital transcription work. The way the service works is quite simple. You purchase an Olympus DSS recorder (I use the DS2300), dictate your letters, blog, articles or statements, plug your handheld recorder into your computer with a USB lead, and download your recordings. You then go into your file manager and click send to email. The recordings are sent to www.uk-transcription.co.uk, who return them to you as soon as they are complete, which is usually within 24 hours for anything of a reasonable length. If you would like to try this service, simply email pearl@uk-transcription.co.uk with a recording and see how you get on. I regularly use the service to dictate my blog, I have to say that the speed always impresses me. I know that a lot of law firms are looking into this technology as an option for cutting costs, and if it gives any indication, I estimate that by using the service, I am saving about 40 to 50 percent of the cost of employing a secretary to work out of our offices to do the same work. It also means that you have very enthusiastic workers available at any time, when you use a service like www.uk-transcription.co.uk, because they have a bank of transcribers who are all available to do the work, and you do not need to worry about staff being off sick or unavailable or overloaded. The transcribers themselves are home workers on the whole are very grateful for the work, with their lifestyles. So the next time you have a piece of work and your secretary is unable to do it for you, give www.uk-transcription.co.uk a thought as it may be worth trying them out and seeing whether they save you money in the short, medium or long term. Jonathan Fagan is Managing Director of Ten Percent Legal Recruitment (www.ten-percent.co.uk). He is also a management consultant and regularly advises law firms on a whole range of business issues as well as recruitment. He can be contacted at cv@ten-percent.co.uk or on 0845 644 3923. Investment in Northern Ireland – New legal opportunities? For some years Ten Percent Legal Recruitment has dabbled with Northern Ireland and firms in the province, and occasionally picked up a vacancy there. In recent times, it has become apparent that with the peace that now reigns there, there are a lot of opportunities for the legal markets to expand quite dramatically. I recently read a report that there has been significant external investments into the region by government and private investment companies, and I have heard it said from local businessmen that there is a considerable amount of development work going on to raise the standard of living and the infrastructure of business to new levels. This has to mean that there are a lot of opportunities starting to open up for law firms in the region, and hence new opportunities for solicitors in terms of recruitment. Ten Percent Legal Recruitment had links with Belfast firms for some years, as well as others in the more rural areas. I hope that with the new development, more firms will start to use services to find staff, that they will need the services of legal recruitment consultants. Jonathan Fagan is Managing Director of www.ten-percent.co.uk. I took a call yesterday from a solicitor on the south coast who described himself as a general practitioner of whom there are very few left these days. He had a young family and wanted to maximise his earning potential, as his current firm were not paying him very much at all. In fact, I estimated that he was being underpaid by a minimum of £5000, and even then, that would be low for a three year P2E solicitor. His dilemma was that as a general practitioner, he had covered a whole wide variety of law and hence had no particular specialism in one area. This means of course when coming to look for an alternative job and with the increased specialism that has taken place in the legal market, he was left to decide what field of law to specialise in and wanted some advice on it. He was dealing with a mixed case load of contentious and non-contentious work. Fortunately the non-contentious work was wills and probates and not conveyancing, as the market for conveyancing in a lot of areas is disappearing fast in the current climate. My advice was, especially with a young family, to concentrate on non-contentious. Contentious work is not only less well paid until partner level, it also involves higher stress levels for the practitioners, particularly when undertaking advocacy. It also hinders any flexibility you may look for in future years, as it is much harder to be a part time litigator than it is to be a part time non-contentious lawyer. Speaking as someone who worked part time as a litigator, it becomes very awkward when a regular client has a trial or a hearing on a day when you are not supposed to be at work, as not only do they expect you to be there, but also your boss does to cover that particular case. So firstly with his young family, I recommended he considered non-contentious work. I also recommended to him that instead of looking for general practice posts he should look for a specialised post, as I think that often firms will try to downgrade someone calling themselves a general practitioner, and offer lower salaries as a result. I’ve always found that anyone who calls themselves a specialist and looks at specialist roles will get a better paid salary although I appreciate that in small firms it is sometimes impossible to just do one area, and may need other areas covering as well. If you are in a similar position, and your firm is not paying you sufficient money to cover even the smallest mortgage, it may be time to consider a move. The only way in the legal profession to generate large amounts of pay rises is either to set up on your own or go to a firm where there is the opportunity to take partnership within a certain amount of time. Obviously that is a different article for another day, but you could certainly think about both options, perhaps speak to your current firm about future partnership prospects before making that decision.